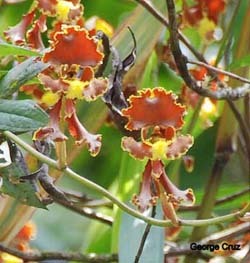 Worldwide there are about 35,000 species of Orchids. Ecuador hosts 4,400 species which is 12-1/2 % of the total species. South American has been well endowed with a vast cornucopia of orchids and Ecuador is fortunate to have been gifted with a large proportion which includes thousands of species The lush vegetation is fed by abundant moisture from the mist-laden air and provides home to a multitude of epiphytes ("air plants") including bromeliads, orchids, mosses and ferns. 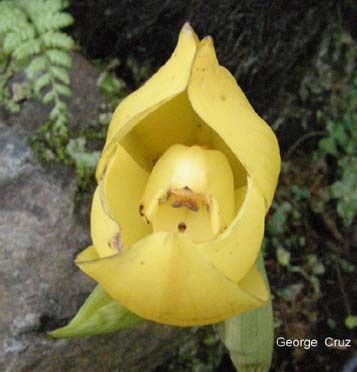 The astonishing diversity of orchids found at The Magic Birding & Photography Circuit, provide enjoyment for visitors also interested in Birdwatching, Hiking, Naturalist Tours and Photography Tours in Ecuador. You will find orchids as epiphytes on trees, as lithophytes on rocks or rooted in the soil in the more traditional terrestrial fashion. Orchids in Ecuador grow in all ecosystems and some species range up to 4000m but the majority are found in the humid cloud forests and rainforests of Ecuador, such as San Jorge de Tandayapa Hummingbird Sanctuary (Tandayapa Valley Cloud Forest) and San Jorge de Milpe Orchid & Bird Reserve (Tropical Rainforest). Some are so plentiful as to be considered weeds growing in disturbed areas. Others grow high up in the crowns of tall tropical trees. If you love orchids then San Jorge Eco-Lodges & Botanical Reserves is the perfect place to see `and admire them in the wild natural environment. One of the most interesting features of orchids is their interactions with pollinators, mainly insects. Many orchids and animals co-evolved together for mutual benefits. 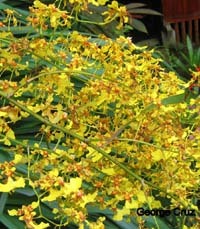 Orchids modified their flowers to attract pollinators. The beautiful shapes, colors and smells of some orchids were not invented to attract bees which are main pollinators of orchids (and flowers in general). 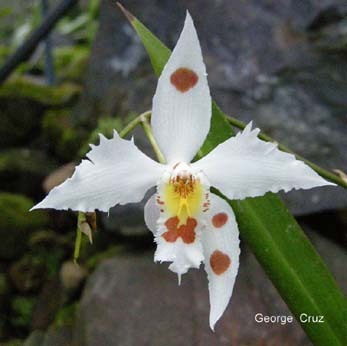 White orchids often bloom at night and attract moths, bats and other nocturnal animals. 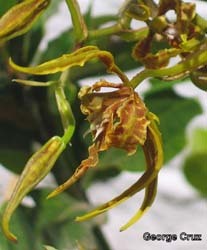 The tubular structures of Elleanthus species offer pollen to hummingbirds. Day Two - Visit El Pahuma Orchid Reserve (Upper Cloud Forest) a 1,500 acre cloud forest wonderland. Observe the plantings of hundreds of native species of orchids, aroids, bromeliads, ferns and shrubs interspersed within the trees. Continue on to San Jorge de Tandayapa Hummingbird Sanctuary (Cloud Forest) and explore the gardens and pristine trails looking for tropical orchids. Contact us for pricing. Please specify for how many people with travel dates. Day Two - Visit Quito Botanical Gardens. Here, you will find every possible plant species in Ecuador, and will be guided through wetlands, cloud forest, high-altitude Andean moorlands and dry forest alive with a profusion of tropical flowers and buzzing hummingbirds. More than 1,200 orchid species and a number of hybrids are exhibited in “crystal Palaces” inside the Botanical Gardens. Return to San Jorge Eco-Lodge & Botanical Reserve/Quito (High Barren Plains) for lunch and to walk the gardens and search for natural orchids at the reserve. Overnight San Jorge/Quito Lodge, includes 3 meals. 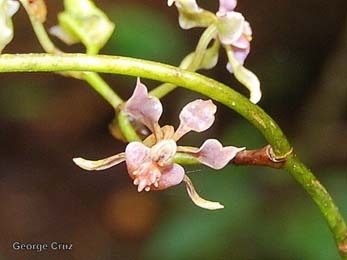 Day Four - Visit Mindo to view natural orchids to view orchids in the lower altitudes. Overnight San Jorge/Milpe Forest Lodge, includes 3 meals (Dine at The Bromeliad Forest Restaurant at the reserve.